Y sigue mi afán por el verde neón, encima el otro día me di cuenta de como se veía este top con este blazer MÁAAS verde aún jaja…me encanta! Este outfit lo podrían usar para salir por ahí, para un cóctel o hasta para ir a trabajar. Qué dicen? Le entran al neón este verano? Keeping with my love for the neon green, and i really like how this top looks with the blazer, even MORE green haha…love it! You could wear something like this to go out anywhere really, for a cocktail or to go to work if you want. Like it? estas muy bella, dime que comes? I love this look!! Those colors are amazing! Can’t ever have enough green. 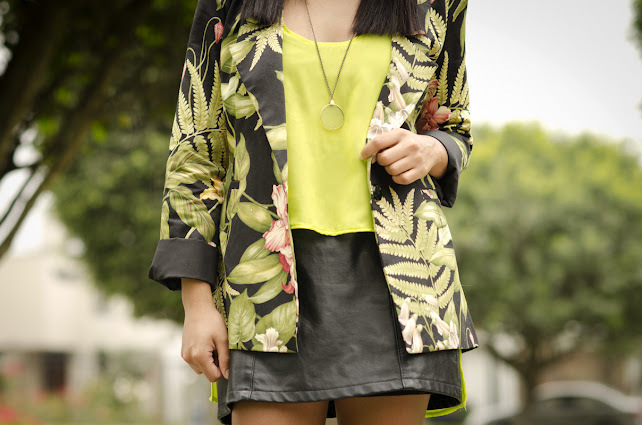 Love that tropical print blazer with the neon green tank. Hey, I really like your style. This kind of green fits you well too. I’m astonished to see this kind auf jackets again, which you wear today, and the royal blue one the time before. ale! me encantan tus zapatos! wow. i love the colors of the blazer and how everythings blends very good together! Would you like follow each othet? los zapatos!!! *____* que lindo outfit!! !